In an ideal world our guests would arrive a few days early to shake off jet lag and/or stay on after a tour to visit some sites. Cinghiale Cycling tours offers a complimentary shuttle at the beginning and end of every tour. Shuttles depart at a fixed time and place specific to each tour, please see your tour page for details. Most tickets need validation on the day of travel from small machines near the tracks. Advance purchased tickets will tell you in the fine print if you need to validate your ticket. A charge of €50 may be incurred if you do not have proper validation. If you forget to validate your ticket we recommend going straight to the conductor and asking for validation. 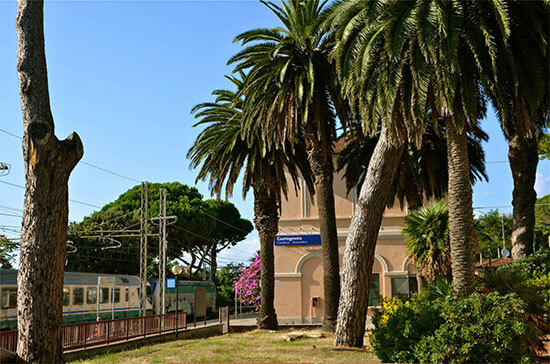 Fast trains— Frecce or Italo trains require advanced reservation. You will be given an assigned carriage and seat with your reservation. Many rental agencies require an international drivers’ license to pick up a rental car. International drivers licenses can be obtained at AAA offices. Best to read the fine print to see if you need one. Many of the fast roads autostrade are tolled. You take a ticket upon entering and pay upon exiting. Credit cards are only accepted in certain lanes, look for carta printed on the sign. Smart carry-on packing can save your tour! We recommend traveling onboard with your cycling shoes, pedals, helmet and at least one cycling kit, essential toiletries, and a change or two of normal clothing — If your checked baggage is late to arrive you won’t miss out! If you decide not to come the amount you have paid so far is fully refundable up to 91 days before the trip. Cancellations after that time forfeit the whole amount paid. We reserve the right to cancel your spot if we have not received your balance payment within one week of the tour balance due date.We do not overbook and strongly recommend trip cancellation insurance.